Resiliency is a term that’s thrown around a lot these days. At the risk of sounding like I’m just jumping on the band wagon, I see resilience as an important lens for our partners’ work in the Anacostia and other Urban Waters locations. The vision for the Urban Waters Federal Partnership is to “revitalize urban waters and the communities that surround them.” In other words, creating healthy waters and healthy communities by repairing past damage and instilling the ability to withstand future threats. Resiliency. There’s a lot happening around resiliency in the Anacostia watershed and in Washington, D.C. In terms of ecosystem health, government and NGO efforts to clean up the Anacostia will allow underwater grasses, wetlands and shellfish to proliferate and take up or filter out harmful pollution, re-establishing the waterway’s “kidneys.” A fishable, swimmable and trash-free river will be a boon for recreation and an asset for the region, particularly residents living close by. If done right, more visitors to the river and surrounding parkland could potentially support local businesses and create jobs, improving resiliency by fueling equitable development and creating opportunities for surrounding communities. Resiliency is more often used in the context of climate change, and cities around the world are recognizing their role as the front line for mitigating and adapting to impacts of a warming planet. While others debate, cities must respond. Last month, the District’s Department of Energy and Environment (DOEE) released Climate Ready DC, a plan for adapting to dangerous heat waves, severe storms, and increased flooding resulting from climate change. The plan is particularly relevant for residents living in proximity to the Anacostia River and its tributaries. Based on findings from leading climate scientists, Climate Ready DC identifies the neighborhoods surrounding Watts Branch as one of the areas of DC most vulnerable to flood risk and lays out broad actions to address these risks. Discussing the Anacostia River with the 100 Resilient Cities team. The Rockefeller Foundation recently selected Washington, D.C. to be part of its 100 Resilient Cities network, an initiative to help cities become more resilient to physical, social and economic challenges. This initiative is bringing together the best and most innovative minds from city government, academia, community organizations and the private sector. Stakeholders will determine the focus of DC’s resiliency strategy in the coming months. It will likely address many of the issues at play in the communities around the Anacostia such as poverty, gentrification, public health, climate mitigation and adaptation, and access. As Anacostia Ambassador under the Urban Waters Partnership, I am one of many voices helping to shape the direction of DC’s resiliency efforts. If restoration, adaptation and resiliency efforts are to be equitable and sustainable, community members who are disproportionately impacted or vulnerable must be engaged in selecting and implementing solutions. 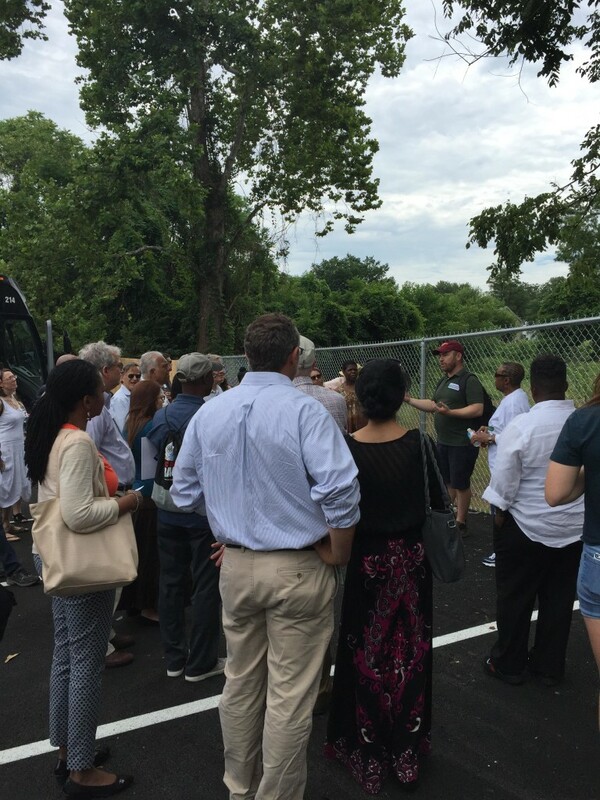 The Anacostia Park and Community Collaborative (APACC), a broad coalition of nonprofit organizations from diverse sectors convened by the Anacostia Waterfront Trust in 2015, is set up to play an important role in engaging at-risk or under-served residents. Many APACC member organizations have never been involved in a discussion of the Anacostia River, the surrounding parkland, or climate change, but they have chosen to work together to achieve “a community-led, equitable revitalization of the Anacostia River parks and adjacent neighborhoods in Wards 7 and 8, as well as a thorough cleanup of the Anacostia River.” APACC has received financial support from the Chesapeake Bay Funders Network’s Capacity Building Initiative as well as administrative support through the Urban Waters Federal Partnership under the Anacostia Ambassador program, which is jointly funded by the U.S. Environmental Protection Agency, the National Park Service and the DOEE. APACC currently comprises 18 members, half of which are based east of the Anacostia in portions of the city found to be most vulnerable to climate change impacts. APACC recognizes tremendous strides the District government and partners are taking to clean up the Anacostia, develop plans for surrounding areas, and manage risks associated with climate change. It therefore also strives to be a forum to engage member organizations and the broader community in these efforts. To that end, APACC will be hosting a public event in late January with DOEE to discuss the Climate Ready DC plan, what it means for residents east of the River, and how organizations may get involved. As Urban Waters Ambassador for the Anacostia River, I’m grateful to work with partners on efforts to improve the resiliency of the river and the surrounding neighborhoods on several fronts. Beyond working through APACC to facilitate meaningful community engagement, I’m collaborating to enhance information sharing, community-based planning efforts and supporting partnerships to implement restoration projects. Resiliency is a catchy word for a complex set of issues facing our neighbors, our waterways and our planet. The Anacostia watershed is fortunate to be at the center of so many efforts to improve the health and sustainability of the river and surrounding communities.